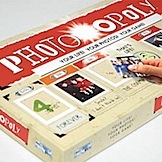 At first, I thought this was going to be a complicated “make your own Monopoly” set-up where you’d have to upload a bunch of photos and choose how they would be laid out on a board, before it created a custom-printed board for you. Actually, this is much different, and potentially more fun. This Photo-opoly just provides you with the guts of a Monopoly board (playing pieces, deeds, specially titled “chance” cards). You supply the photos out of the shoebox, cut them to fit the boxes, and glue them on. It sounds like a big project, but promises to “unleash your creative genius” (if you have one lurking inside). The Photo-opoly can be renamed around any theme you desire, but has to retain the “opoly” ending, likely for licensing reasons.